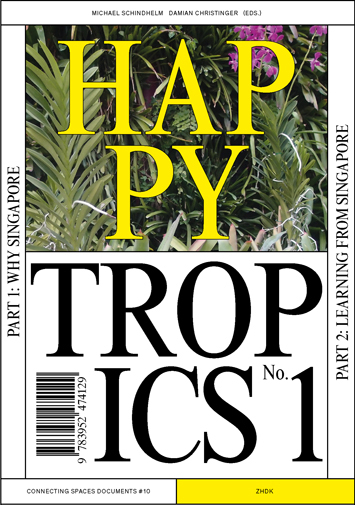 HAPPY TROPICS 1 is a publication based on research of Michael Schindhelm and Damian Christinger in collaboration with Zurich University of the arts and a number of master students, ETH Zurich Future Cities Lab (Singapore), Rem Koolhaas (OMA, Rotterdam) and various arts organisations, administrations and actors in Singapore. Had Claude Lévi-Strauss travelled to Southeast Asia instead of Brazil, as he did in the nineteen-fifties, he would have perhaps adopted the same mournful and resigned tone he did in Triste Tropiques. Singapore would have seemed like a soupy, sticky battleground of postcolonial exchange. It was a young nation, placed on a vulnerable archipelago, with a small British-oriented elite and an overabundance of penniless fishermen and domestic servants. Twenty years later, he would have encountered a scene of unprecedented urbanization. Singapore grew both out to sea, and up to the sky. The city’s new powerbrokers named their development strategy Vision 99, whose success saw people flocking to the small nation from not only the furthest corners of Asia, but eventually also the West. Through a tremendous and tireless effort, Singapore has emerged as a unique economic – and in many ways social – project. Today, fifty years since the city was founded, Singapore has the highest investment potential in the world. It is home to some 3 million locals, as well as roughly as many foreigners from all over the world – a diverse mix of people who enjoy a standard of living that makes even the residents of the most highly-developed Western nations envious. Happy Tropics? As Western nations struggling with political populism, an aging population, and economic stagnation face the frightening possibility of the demise of their social contract, Singapore is developing their alternative to the Western model, which some call the Guardian State. Understanding culture as a mirror of society, instrument of national identification, and site for dialogue and exchange with other cultures allows us to view it as a litmus test for the resilience of a societal concept. Is Singapore a viable alternative? We will never know what Lévi-Strauss would have said about this matter, but it is our intention to provide at least preliminary answers through a continuation of the research that we have set in motion with this book. We will explore what role culture plays in answering this question, as well as what this model implies for the future development of global Western culture. Happy Tropics No.1 is released as the “Connecting Spaces Document #10”, a series published by Zurich University of the Arts. Happy Tropics No. 1 is available on issuu.